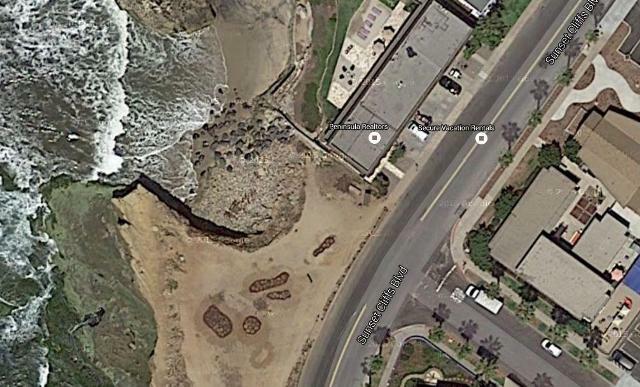 Adair and Sunset Cliffs Blvd – near where photographer was swept off rocks. A photographer was swept into the water off rocks he was standing on while taking photos, Thursday evening. After a frantic search by a number of people who jumped into the water to save him but couldn’t get to him or help him get out of the water, the unidentified man was saved by lifeguards. He was hoisted up to the top of the Cliffs near Adair Street and Sunset Cliffs Boulevard and was apparently uninjured. The man had been standing on or near the cliffs as the tide was moving in – this was around 7:45 pm – when a wave came up and swept him into the ocean. He became trapped and wasn’t able to reach safety. At least 3 people then jumped in but couldn’t help him. Lifeguards arrived and were able to lift him up the cliffs. How’d his photos turn out?